Pepparkakor is a traditional Swedish recipe. These Scandinavian spicy biscuits are traditionally served on St Lucia Day, which is a celebration of light on the longest night of the year. St Lucia Day is one of the biggest Christmas-time celebrations in Sweden and is held on the 13th December. This date was unknown to Mum and I when we made these biscuits, and in one of those spooky moments of synchronicity and also a happy confluence of events, this happened to be the very day that Mum and I made these biscuits. there is no creaming of the butter and sugar, just mixing, making it very easy and quick to make. The dough is great to work with – it is smooth, and a nice consistency for rolling. You don’t need baking paper or flour on top of the dough to stop it from sticking to the rolling pin – it just doesn’t stick. Also you can roll the dough out many times and it will still be the same texture and won’t go tough. This dough gives a consistent bake with the result being beautifully smooth surfaced biscuits, with even colour and texture. They puff up slightly in the oven, but don’t spread, making this great dough to make gingerbread houses out of. The liquid sugar part of this dough is heated on the oven top, (then the flour is added). No wonder the Scandinavians made these biscuits during the cold winter, as the heated ingredients make the dough lovely and warm and it warms the hands while kneading. The fun part of this recipe is adding the baking soda to the hot sugar and golden syrup mixture and watching it froth up like a science experiment (which as a friend reminded me, is a chemical reaction between acids and alkalis. The baking soda is alkaline and when combined with the hot sugars, produces carbon dioxide gas, which causes bubbles to form creating rise). These biscuits will keep for at least three weeks. They are very crisp after cooling, then become softer when stored and the spicy flavour gets better and better. We used golden syrup, but if you want a darker colour to the gingerbread, replace the golden syrup with treacle, or you could use muscovado sugar instead of brown sugar. We referred to The Great British Bake Off: Showstoppers book for the Royal Icing recipe. This recipe is great as it is quick to make, because the egg white is hand-whisked rather than beaten in a mixer. A little of this mixture goes a long way. Preheat oven to 160 degrees Celsius, and line baking trays with baking paper. Chop the butter into cubes, and place in a heatproof mixing bowl. Heat the sugars, spices, and golden syrup in a saucepan, stirring with a wooden spoon until the mixture comes to the boil. Add baking soda and stir until mixture froths and turns a pale gold. Remove from the heat and pour onto the butter in the bowl. Stir well with a wooden spoon until the butter melts. Add the beaten egg, followed by the flour, in quarter amounts, and mix thoroughly to make a soft dough. Turn the dough out onto a lightly floured surface and knead lightly until smooth. Cut in half and shape each into a rectangle. Wrap in waxed paper and place in fridge for about 15 minutes or until the dough is firm enough to roll out. Roll out one half of the dough on baking paper, or a floured surface, to about 3mm thick. 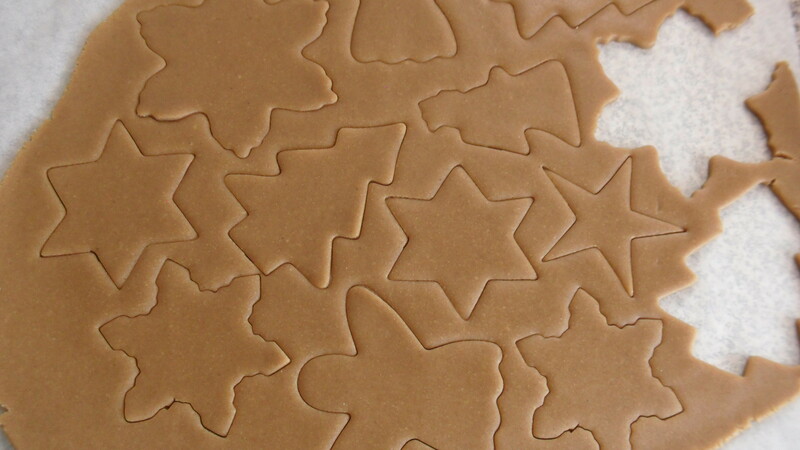 Cut out shapes and place on baking tray. 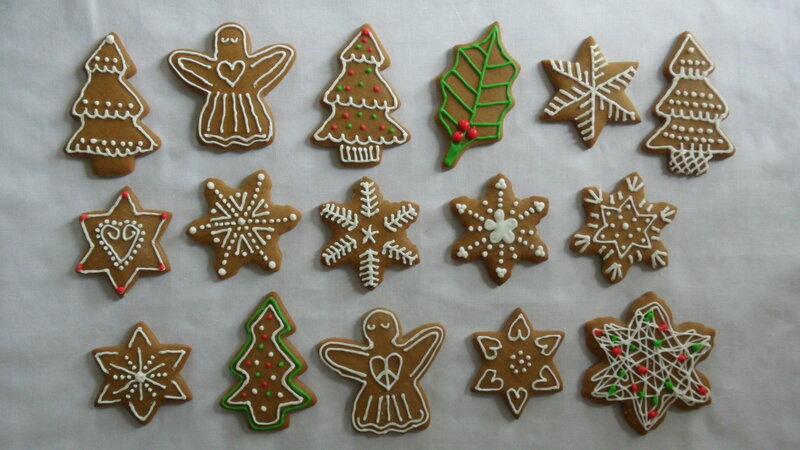 TIP: if you want to hang the biscuits on a Christmas tree, poke holes in the biscuits with a skewer before baking. Bake for about 10-15 minutes. They are cooked when they are just beginning to brown. Cool on racks and store in an airtight container. Repeat steps 7-8 using the other half of the dough. Use a hand whisk or wooden spoon to beat egg white and lemon juice, until thoroughly combined. Gradually add icing sugar to make a smooth icing. To make the red and green icing, separate a spoonful or two of icing out into two small bowls, and add a few drops of red food colouring to one bowl, and a few drops of green food colouring to the other bowl. 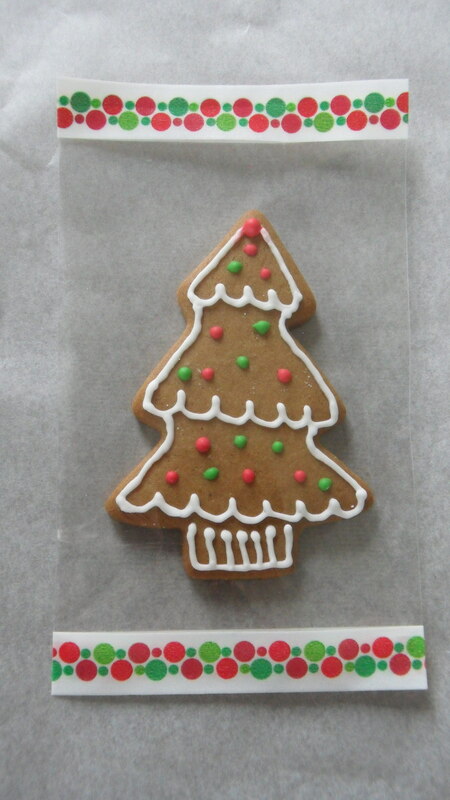 ICING TIP: Use small plastic zip-lock bags, about 9cm tall x 6cm wide and fill with icing. Seal the top. Use a thick needle or a bodkin and poke a hole in one of the corners to force the icing through. This size bag sits nicely in the palm of the hand and is easy to control, like an icing pen. COOK’S TIP: Place the leftover egg yolk in a small bowl and cover the yolk with cold water. Store in fridge for later use. I made a decorative package with a cellophane bag and a few strips of washi tape. Place the tape along the top and bottom edges of the bag on the front and on the back. I personalised the washi tape to match the decorations and colour-theme on the biscuit. The Great British Bake Off: How to Turn Everyday Bakes into Showstoppers. By Linda Collister ; technical challenge and signature bake recipes by Mary Berry and Paul Hollywood. 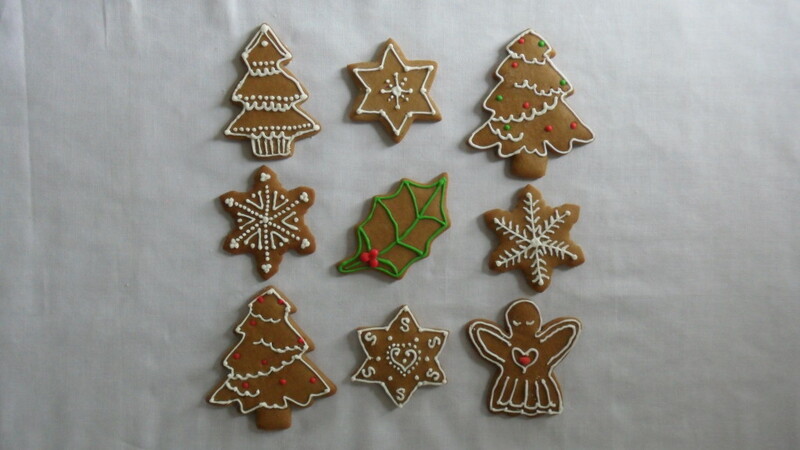 Yuletide Gingerbread Biscuits – Taste Magazine, December 2014.